Ron Johnson’s plan should have worked. 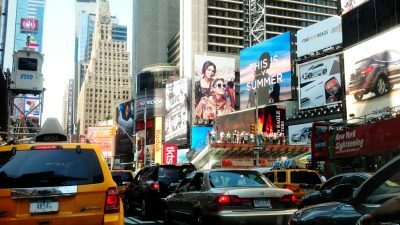 The veteran retail strategist knew how to turn brick and mortar stores into customer magnets because he’d done it before–twice–even as retailers across the country watched foot traffic evaporate and sales plummet. But when he joined JCPenney, he went after one of the American retailer’s most popular programs: coupons. This was the pitch: Customers would no longer have to spend their time looking for deals. Instead, prices would always be low. Go to minute 1:26 on this audio to hear what JCPenney customers had to say about this idea. Why such a visceral reaction to a pricing change? Once you start discounting your products, it’s *incredibly* difficult to charge full price in the future, even if that full price is still low. You train your customers to expect sales and discounts–and then that’s the only time they buy. Hearing someone say they’re “traumatized” after a company changes its pricing strategy might feel…overdone. But, as Kevin Hillstrom puts it, when you change the rules of the pricing game, you break a promise. And broken promises break hearts. That’s why I’m begging you not to send a discount email to users who don’t upgrade at the end of their opt-in free trial. 50% off is an enormous discount! 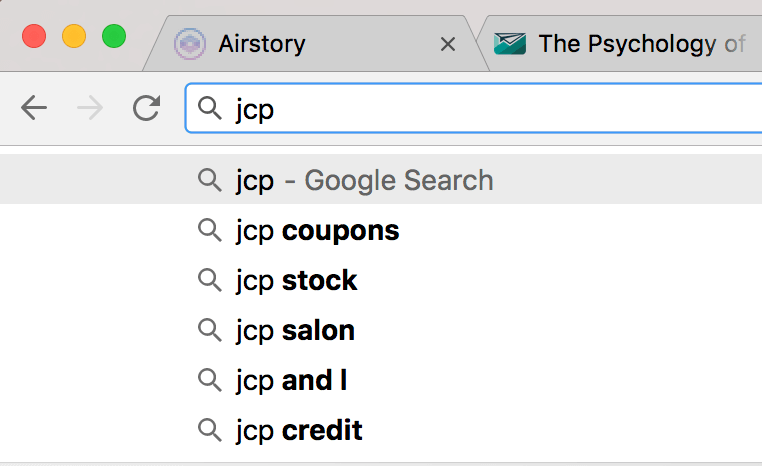 If you rely on discounts to close deals, you’re training your customers to expect discounts as an ongoing part of your relationship–just like JCPenney. Sure, you might scoop up some prospects who are excited about getting a deal. But it comes at a cost. According to the smart folks at Price Intelligently, discounting can decrease SaaS customer lifetime value by 30%. The most painful part about this is that you’re losing this revenue by discounting when your best prospects don’t even want you to discount. According to one estimate by researchers Doctors, Riley, and Gieskes, “rarely are there more than 24 percent of customers at risk due to price”. When you send a discount email, you’re ignoring the roughly 76% of customers who likely do not need or want a discount– but want something else. Your best prospects might actually be willing and able to pay 10X your price. But if you fail to address the real barriers standing between your customer and the “upgrade” button, you’ll still lose them. Here’s how to write data-driven research-backed end of trial messages that actually work. First, look at what your non-converting active users do before the trial wraps up. Look for areas where your prospects might be getting stuck or behaving differently than users who upgrade. Identifying where people start to drop away will be helpful–but what you really need to understand is why that’s happening. Let’s imagine your analysis found that your active trial users click through to the pricing or checkout page at the end of the trial…and do nothing. “A-ha! Must be too expensive, a discount will help here,” you may wrongly conclude. Please, I beg of you: resist the siren’s call to send a discount email–or any email–before you know why your best prospects are lingering without paying. And each one of these price-page related objections needs a different message if it’s going to be overcome. To figure out what’s going on in your customers’ minds, interview them. How do you do that? For a primer on interview technique, read this interview guide by Dustin Walker for Crazy Egg. Interview both recently upgraded customers and active trial users who haven’t upgraded. When you’re writing a list of questions, use Jobs to Be Done (JTBD) framework to understand the job your prospects “hire” your app to do. What was the conversation like when you talked about purchasing the product with your <BOSS/Decision-maker>? Before you purchased, did you imagine what life would be like with the product? Where were you when you were thinking this? Did you have any anxiety about the purchase? Did you hear something about the product that made you nervous? What was it? Why did it make you nervous? What was happening in your world that led you to sign up for [PRODUCT]? What happened during your trial that convinced you [PRODUCT] was the right solution? Record your conversations so that you can go back to the audio or transcript and get the exact language your customers use. This is called “voice of customer data” and it’s among the most powerful tools in your copywriting shed. Do interviews take way longer than most other customer listening methods? Not if you account for all the time saved on the backend with richer insights than you’ll find anywhere else. You’ve got the data to help you ignore the discounts’ sirens call. You’ve analyzed your data and identified (and fixed) bottlenecks due to in-app issues. You’ve scheduled and conducted your customer interviews. Now how do you turn what you’ve learned into actual messages that get actual results? Every app will be different, but here are here are a few common emails you can send to prospects in 3 common scenarios. Scenario #1: If you hear, “I’m not the decision-maker” or “I have to ask my boss first,” help your readers get buy-in. If your prospects need to fight the bureaucratic beast to go through corporate procurement to keep using your app, see advice from Ben Horowitz, Leadfeeder, and Patrick McKenzie. But if the primary user merely works down the hall from someone with credit card authority, you can use your end of trial emails to help your active users plead their case. 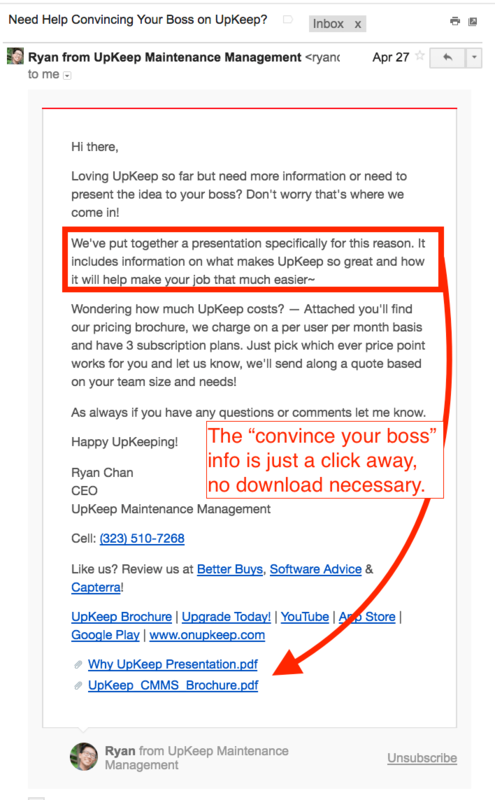 Follow Upkeep’s example and send your readers all of the information that someone might need to convince their boss to use your app. This is a great starting point. If I were optimizing UpKeep’s emails, I would take it one step further and test a presentation with pre-written email scripts and a presentation written from the perspective of the user who needs to make their case. Scenario #2: If you hear, “I don’t really see the value”, show the value. Even if your prospect has achieved all of the success milestones that typically precede becoming a paying customer, they still might not have seen the value in paying yet. There are a few ways you can help your readers understand. 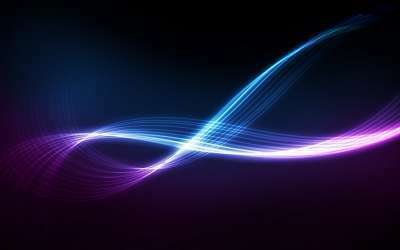 One is by tapping into our natural aversion to loss. Loss aversion is the psychological theory that we feel losses more acutely than we feel gains of the same size. This Yesware reminds readers of the features they’ll lose. 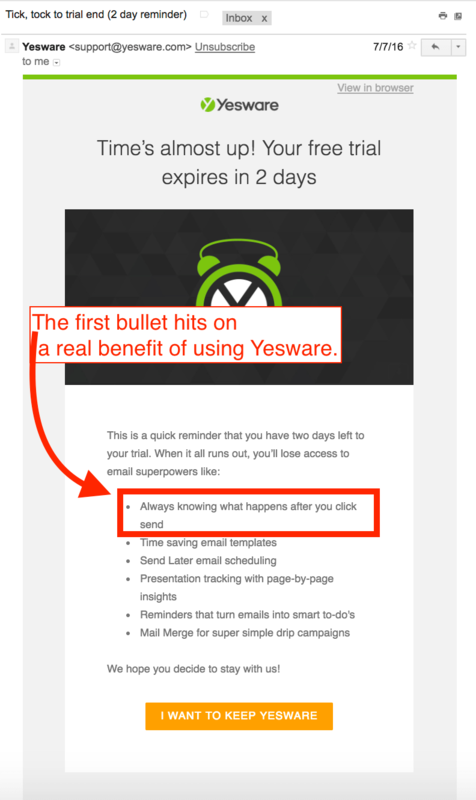 If I was optimizing this email, I would test it against a customer-centric email pointing to more benefits or outcomes like the first bullet. Another way of showing the value is to lean on the results of other users. Maybe the limitations of your app’s category mean that your user probably won’t experience a huge win during a 14 or 30 day trial. 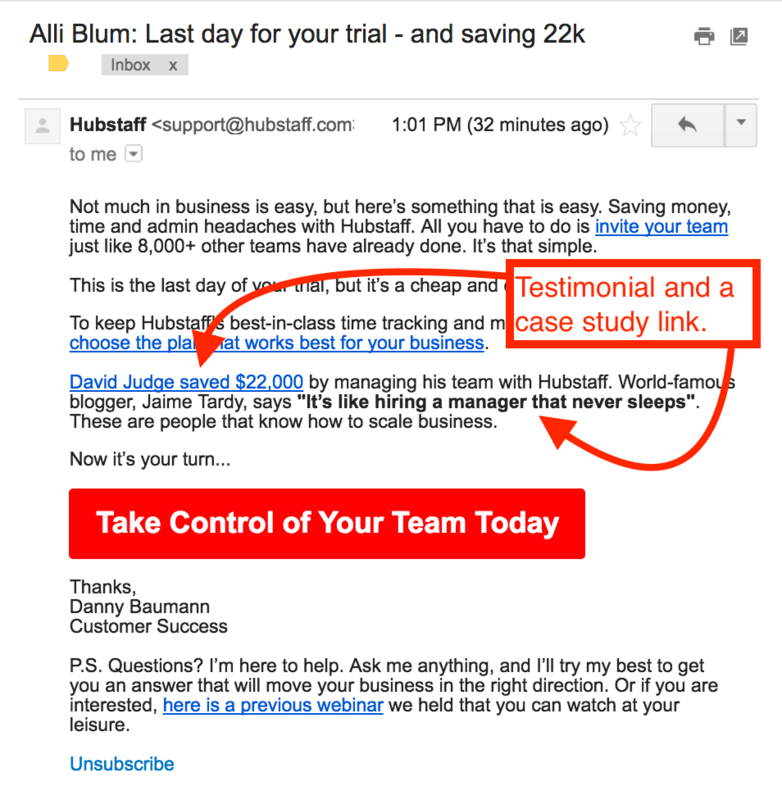 But if they’ve already taken the first steps to getting somewhere worth going, you can use social proof to show them where they’ll end up–like in this example from Hubstaff. This email has great social proof and a clearly marked CTA. If I was optimizing it, I might try CTA language that’s more clearly tied to the immediate outcome of the click and/or telling the story of the case study right in the email. Scenario #3: If you hear “I haven’t had time” or “I’m overwhelmed”, make it easy. No matter how much of the hidden work you eliminate from your onboarding process, your prospects will still have to do some work to get started. 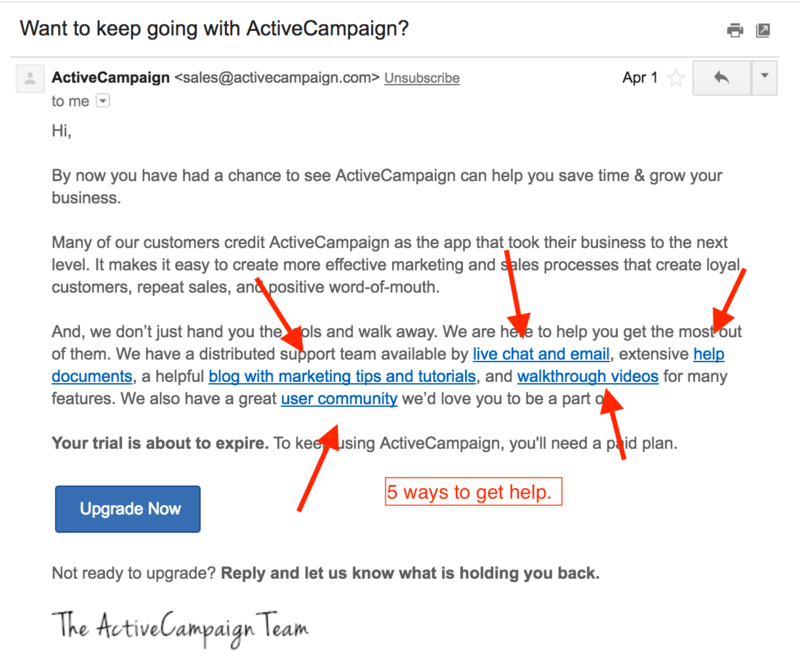 In these cases, you can test end-of-trial messaging that offers support like this ActiveCampaign email. This email offers an array of ways to get support from ActiveCampaign (which I know from personal experience to be top-notch). If I was taking it one step further, I might focus on testing an email with specific support for some of the common setup challenges against offers of general support. But it’s also possible that the real barrier is that getting started involves a giant complicated, messy project. Your prospects might find that getting started is full of unavoidable work that takes too much time to make upgrading an easy-peasy choice. If this is the case (and if you have the resources to make it happen), you may consider offering real done-for-you support. 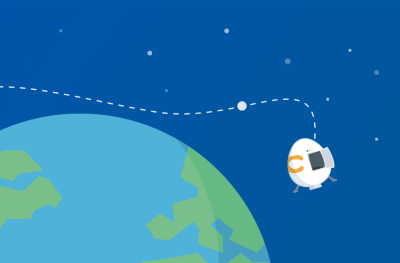 Email automation providers Convertkit and ActiveCampaign offer free and paid concierge migration services to make it easier to switch from one email provider to another. 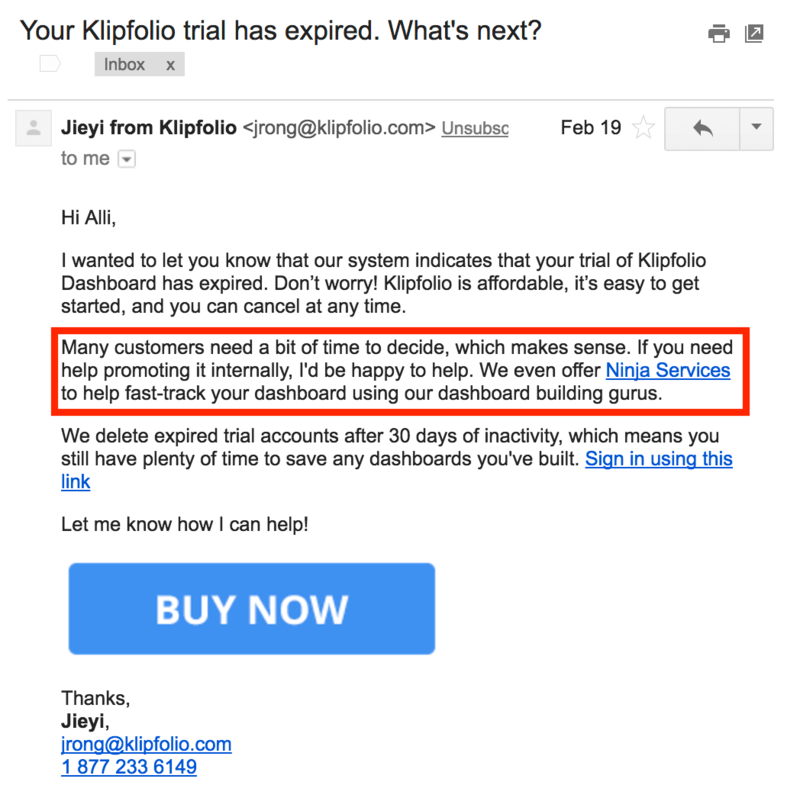 Dashboard-builder app Klipfolio offers an array of paid “Ninja Services” to help new customers get started (plus help promoting it internally). 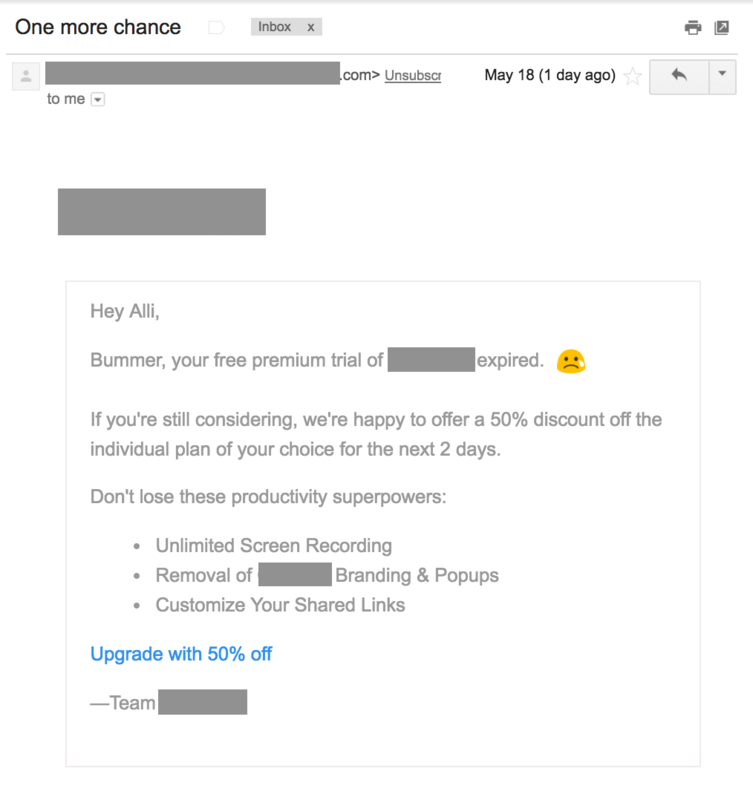 This email hits the ground running with a hefty helping of loss aversion and a side of extra support. If I were optimizing this email, I’d start by deciding on one goal: “Get extra help from our Ninjas” OR “Buy now”. Also, it might be helpful to be clear about what “Ninja Services” are. Not long after Johnson launched his JCPenney strategy, he was out of a job. JCPenney went back to discounting. But the analysts’ debate about what could or should have been done rages on. If you ask me, the moment when things got tough happened years ago. It happened when they first started offering discounts: the discounts became the thing that Penney’s shoppers wanted–even more than the merchandise. And if YOU offer unasked-for discounts to your customers as soon as they walk in the door, the same could happen to your app. …and keep the 30% of revenue you otherwise would have lost. About the Author: Alli Blum helps SaaS companies build messages that get customers at howdotheygetcustomers.com. Go here to get her free interview invitation template pack and start interviewing your customers today.